This Rogue is just fantastic! I Love it! 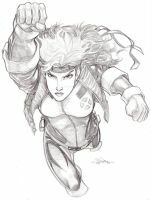 Love 80s Rogue. That little white hair tuft is so cute! Also love the flourish in the background! one of the best Rouge costumes. Nice job! Great look, the 80's were good to the X-girls. I still like her 90's green and yellow costume with the jacket a bit more, though. i'm a green & white hood guy myself.